This history of HMI since World War II shows how its independence derives from the work of the 19th century inspectors and examines the relationship between HMI and school, local education authorities and the government. It considers the effect of the 1988 and 1992 Education Acts. 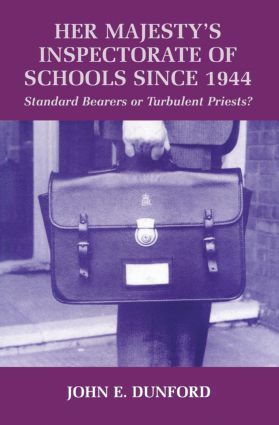 The Journal of the Secondary Heads Association - "John dunford"s extremly topical book manages to combine the academic rigour of a doctrate thesis, which is where it originated, with the wisdom and insights of an outstanding headteacher practitioner…John"s book is a tour de force. It is strongly recommended." Institute of Education - "..excellent.."
History of Education Society Bulletin- " Her Majesty"s Inspectorate of Schools is…a much needed volume…it is accessible, well structured and presented…It is important not only for students of educational history but of interest to anyone who has recent experience of school inspections"
Journal of Education Policy- " an excellent book"
"At a time when we ought to be debating the best mode of school inspection in this country, it is useful to have a book which reminds us of the benefits-and the shortcoming-of HMI before OFSTED.